In organizations that use repeating directory tree structures, it is possible to optimize the number of ACIs used in the directory by using macros. Reducing the number of ACIs in your directory tree makes it easier to manage your access control policy and improves the efficiency of ACI memory usage. Macros are placeholders that are used to represent a DN, or a portion of a DN, in an ACI. You can use a macro to represent a DN in the target portion of the ACI or in the bind rule portion, or both. In practice, when Directory Server gets an incoming LDAP operation, the ACI macros are matched against the resource targeted by the LDAP operation. If there is a match, the macro is replaced by the value of the DN of the targeted resource. Directory Server then evaluates the ACI normally. Figure 18.1, “Example Directory Tree for Macro ACIs” shows a directory tree which uses macro ACIs to effectively reduce the overall number of ACIs. This illustration uses repeating pattern of subdomains with the same tree structure (ou=groups, ou=people). This pattern is also repeated across the tree because the Example Corp. directory tree stores the suffixes dc=hostedCompany2,dc=example,dc=com and dc=hostedCompany3,dc=example,dc=com. This ACI grants read and search rights to the DomainAdmins group to any entry in the dc=hostedCompany1,dc=example,dc=com tree. The target keyword, which was not previously used, is utilized in the new ACI. In this example, the number of ACIs is reduced from four to one. The real benefit is a factor of how many repeating patterns you have down and across your directory tree. In this section, the ACI keywords used to provide bind credentials, such as userdn, roledn, groupdn, and userattr, are collectively called the subject, as opposed to the target, of the ACI. Macro ACIs can be used in the target part or the subject part of an ACI. If you use ($dn) in targetfilter, userdn, roledn, groupdn, userattr, you must define a target that contains ($dn). If you use [$dn] in targetfilter, userdn, roledn, groupdn, userattr, you must define a target that contains ($dn). When using any macro, you always need a target definition that contains the ($dn) macro. You can combine the ($dn) macro and the ($attr.attrName) macro. The ($dn) macro matches with dc=subdomain1,dc=hostedCompany1. Once the macro has been expanded, Directory Server evaluates the ACI following the normal process to determine whether access is granted. The matching mechanism for [$dn] is slightly different than for ($dn). The DN of the targeted resource is examined several times, each time dropping the left-most RDN component, until a match is found. ($dn) in the target matches dc=subdomain1,dc=hostedCompany1. [$dn] in the subject is replaces with dc=subdomain1,dc=hostedCompany1. The result is groupdn="ldap:///cn=DomainAdmins,ou=Groups,dc=subdomain1,dc=hostedCompany1,dc=example,dc=com". If the bind DN is a member of that group, the matching process stops, and the ACI is evaluated. If it does not match, the process continues. [$dn] in the subject is replaced with dc=hostedCompany1. The result is groupdn="ldap:///cn=DomainAdmins,ou=Groups,dc=hostedCompany1,dc=example,dc=com". In this case, if the bind DN is not a member of that group, the ACI is not evaluated. If it is a member, the ACI is evaluated. The advantage of the [$dn] macro is that it provides a flexible way of granting access to domain-level administrators to all the subdomains in the directory tree. Therefore, it is useful for expressing a hierarchical relationship between domains. 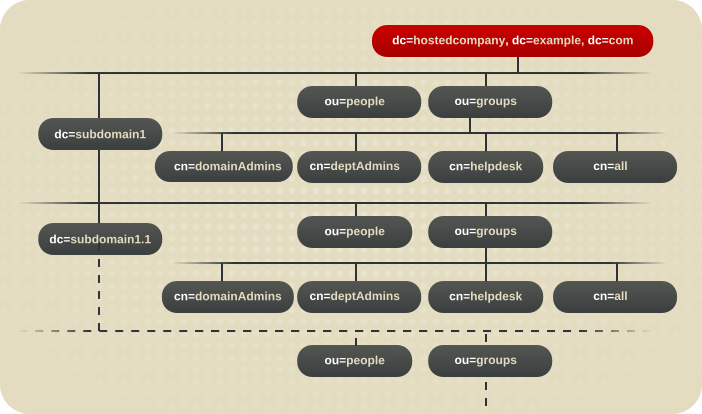 It grants access to the members of cn=DomainAdmins,ou=Groups,dc=hostedCompany1,dc=example,dc=com to all of the subdomains under dc=hostedCompany1, so an administrator belonging to that group could access a subtree like ou=people,dc=subdomain1.1,dc=subdomain1. However, at the same time, members of cn=DomainAdmins,ou=Groups,dc=subdomain1.1 would be denied access to the ou=people,dc=hostedCompany1 and ou=people,dc=hostedCompany1 nodes. The Directory Server then evaluates the ACI according to the normal ACI evaluation algorithm.